The financial centre’s $32 bln haul of new listings this year puts it in the global lead. Yet 72 pct of debutantes are trading below their offer prices, and overall trading is thin. Too few long-term investors and a crowded but illiquid market are to blame. Both are hard to fix. 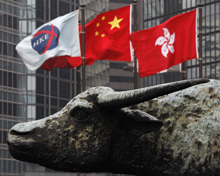 New funds from initial public offerings in Hong Kong reached $32.3 billion in the year to Dec. 18, surpassing the $31.3 billion raised on the New York Stock Exchange and $29.2 billion on the Nasdaq, according to data from Dealogic. This puts Hong Kong on track to be the world's top IPO market in 2018.